Geese in the Bog is a traditional Irish jig ~ bouncy music that will set your toes a’tappin’. 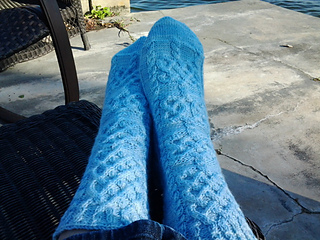 So knit up a pair and put on your dancing shoes ~ the party’s about to begin! 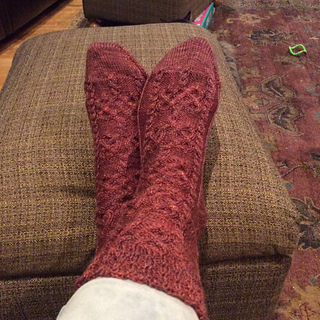 These toe-up socks begin with a wide (wedge) toe; two alternating closed-ring cable motifs are worked on the instep while the sole is worked in Stockinette. 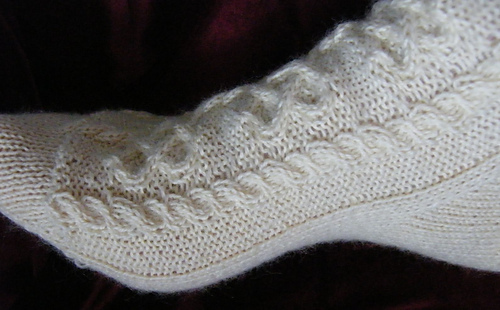 Once increases for the gusset have been completed, the short-row heel cap is worked leading into a slipped stitch heel flap; no need to pick up stitches. 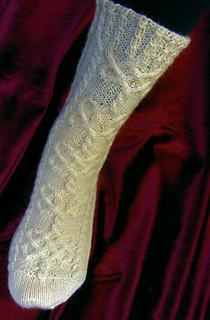 A variation of the cable motif is worked on the back leg. The bind off requires the knitter to be able to identify knit and purl stitches. Both charts and written directions for charts are provided. Charts are contained in the main pattern PDF; the written directions for charts are included as a separate PDF. Finished foot circumference: 7.5 (8, 8.5)“/ 19 (20.5, 21.5)cm. Finished foot length: 8.25 (9.5, 10)”/ 21 (24, 25.5)cm. 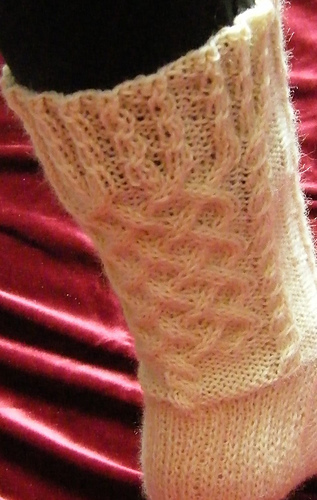 Bottom of heel to top of ribbing: approx. 9”/ 23cm. Sample in size M on 8.5”/ 21.5cm foot. Many thanks to the wonderful Ravellers who test knit this design: bgow, contemax, Cydiba, , dragonxser, faeriepaw, KateB660, ladywulf, momtatknits, spstacey, susu2u and woollykim.